A couple of weeks ago, I visited Smokin' Aces North at the invitation of a friend. I did not realize what a great opportunity that was. Readers of this blog know that I Forrest Gump my way around greatness. But, before we go into my latest Gump move, know that Smokin' Aces North is currently in a transition. Aces North already had the bar part of "Bar & Grill" figured out. Now, they are working on the grill part of the Bar & Grill in a big way. Smokin' Aces North wants to bring in lunch and family dining during the daylight hours. They will then transition to the bar focus after 9 pm. The menu is expanding to include many barbecue items such as the Brisket Sundae, Xtreme 1/2 pound burger, stuffed Poblano peppers, steaks, some of those really good chicken wings I tried last time, and also meals for kids. Local diners are discovering that they can stop by Aces North during their lunch break for some delicious barbecue. Some folks are also taking the family in for dinner. There are plans on developing a food challenge for adventurous hungry types who want to eat a big meal and provide entertainment for other guests. So here is why I am so excited. Aces North has brought JD Davidsmeyer of JD's Team Xtreme BBQ to operate the Team Xtreme kitchen. You may have seen JD Davidsmeyer on TV episodes of BBQ Pitmasters. Here is a video of JD working on some Las Vegas Strip Steak for the show. JD's kitchen is a joint venture between him and the ownership. That means that the other night when I visited Smokin' Aces, the wings were his work. In my own spaced-out mind, I though maybe it was the beer talking, or the cook just got lucky. I didn't realize there was real talent at work. JD Davidsmeyer has tons of experience with competitive cooking and brings that skill set to Smokin' Aces North. His specialties are chicken and ribs; but, he knows his way around other meats too. In my last blog post about Aces, I wrote that I might have to go back and try the steak. Well, JD read the post and invited me to try out the steak as his treat. I took the offer, of course. You don't turn down a pit master offering you a steak. At least not in Texas. We spent a good chunk of time interviewing. I'm going to write more about JD Davidsmeyer on another post. The guy has an interesting story about how he wound up making barbecue his passion in life. I don't say that barbecue is his passion lightly. There is a dead seriousness about JD when he talks about barbecue. It's all about the process, according to JD. You have to really know your meats. At this point, I was really wanting to know my steak, so I asked him to show me how to cook a steak. We went back into the kitchen where he turned on the cast iron skillet and then shuffled through some steaks in the cooler to find one he liked. The steaks are marinaded for 15 hours before they are brought to the restaurant. That is another thing that I want to point out. JD isn't just some cook frying steaks in a pan. When JD Davidsmeyer cooks, it's a commitment. After shutting down the kitchen at night, JD gets to work on the next day's meats at home. He mans the fire all night, taking power naps and checking on the meat periodically. He is done by 6 am when he finally gets some sleep. When it's time to go to work, he brings the meats with him to the restaurant. All of JD's dedication pays off. That steak went from the refrigerator, to the grill, to my plate. Not once was it touched by salt, pepper, or a sauce. He did lightly baste the steak with butter to flame sear the steak. When I started eating the steak, it was amazing. It was as juicy on the outside as it was on the inside. It was tender and a delicious pink. 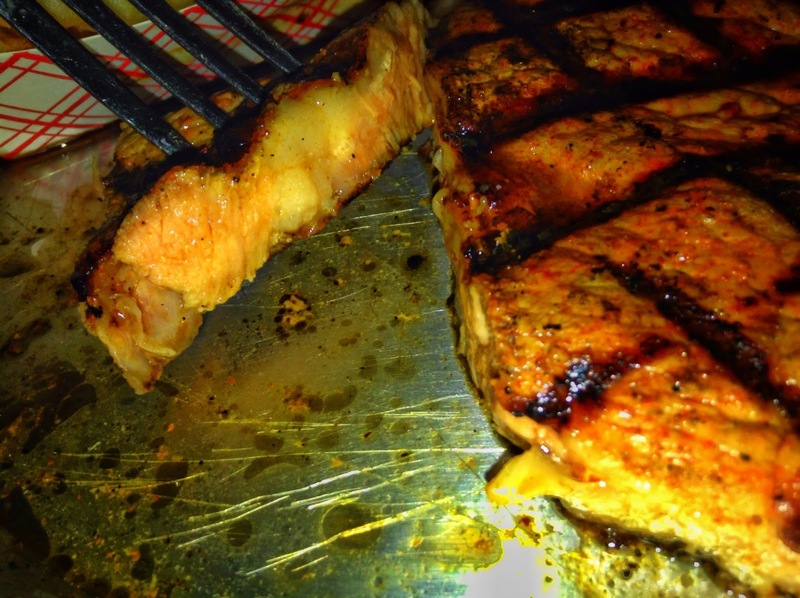 Normally for me, steaks taste good, but they are missing something, which is a steak sauce or a squeeze of lemon. Once cooked, JD takes it personally if you put steak sauce on your meat before you even taste it. I would too, if I could cook a steak like he does. "Sauces are to cover up the f$%k-up", he says. Well prepared meat does not require the aid of any sauce. It is delicious on its own. I cut off a chunk of the steak and went to town on it. As the steak got smaller, I started cutting smaller pieces to make it last longer. Things got so that started using mental tricks to make the experience better. I chewed slowly. I closed my eyes. And I tasted everything that steak had to offer. Oooh, yeah. When you do stop by Aces North to have a JD's Team Xtreme BBQ steak, brisket, or chicken, consider yourself on the ground floor of something great. This is the start of a whole new experience at Smokin' Aces North with the addition of JD's Team Xtreme BBQ kitchen. It is going to be a much better experience than you could get at some fancy pants barbecue restaurant. You want to try it out before the crowds show up. Up next, I'm going to write about JD Davidsmeyer's journey in competitive barbecue. Yesterday after work, a friend invited me to Smokin Aces North, a bar in McAllen near 10th Street and Martin. If you're into live music by local bands, you're probably familiar with Aces. Once upon a time, there was an Aces in Mission; but, people started complaining and things got political, so the place shut down. Still, even back then, they were big into the music scene. I think that's what's important here, that there are places for local talent to perform. My buddy, +Richie Trevino, used have a rock band a few years back. He still writes songs here and there. It's cool to see that even though he isn't performing anymore, he supports other bands when he can. It was interesting to see that some of the other people at the bar were also performers. I didn't know that there was a community of artists in the RGV until last night. Last night, Radio on Repeat was playing some cover songs. These are some young guys with good sound. The band consists of guitar player Joshua Lopez, vocalist Ray Hinojosa, bassist Joe Anzaldua, and drummer Caesar Elias. They had a good mix of cover songs that even an old guy like myself can enjoy. If you get a chance to check out live performances here in the Rio Grande Valley, I think you will be pleasantly surprised. One thing I wasn't expecting to find at Smokin Aces was that they have a kitchen. We ordered some of the fattest chicken wings I've ever had. They were delicious. One of these days, I'm going to have to give their steak a try.